Bikes! 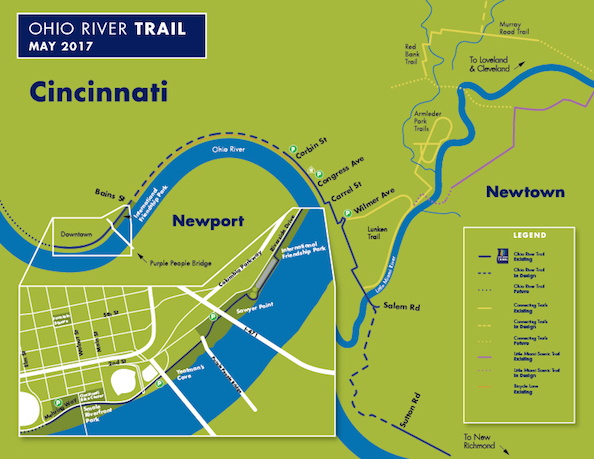 Riding Trails in Cincinnati – Go There. Try That. I’ve been sitting on this experience post because, honestly, I wasn’t sure how to write it. But, considering summer is here, I needed to write it now while there is plenty of summer to . . . ride. Yep. My new love? Bike riding! Please know, I am in no way an experienced biker. I’m not a cyclist. I know cyclists and I have much respect for them. I guess this post is more for people who want to try something new. Who maybe have a bike in their garage or in their basement and just haven’t gotten it out in years. This post is for people who think, hey, I’d like to try that again, but I’m not sure that I can. It’s for those who last rode their bike in a galaxy far, far away. Do it!! Dust the bike off. Dig it out of the garage or basement. Borrow a bike from a friend. Take a spin around the neighborhood and fall in love with riding again. Riding my neighborhood when I first got my bike. Two years ago, I would not have been riding a bicycle (that’s a whole other story). But, about a year ago, I got the itch. I wanted to explore different forms of exercise that, well, don’t feel like punishment. 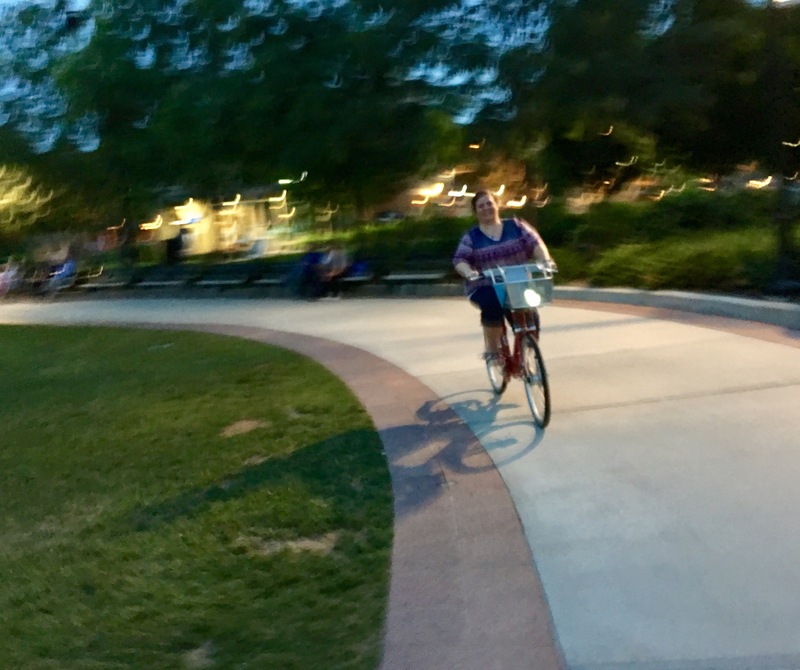 I started taking my old, blue, single-speed bike for wobbly spins around the block. Getting the feel for it. Literally. I would pass my neighbors, wave to them, and holler tidings as I sped by. I was practicing things like not falling off, stopping suddenly, going around corners, and getting up and down the sidewalk! I started as a tentative, white-knuckled rider. Then, after a month or two, I asked for a new bike for my birthday. 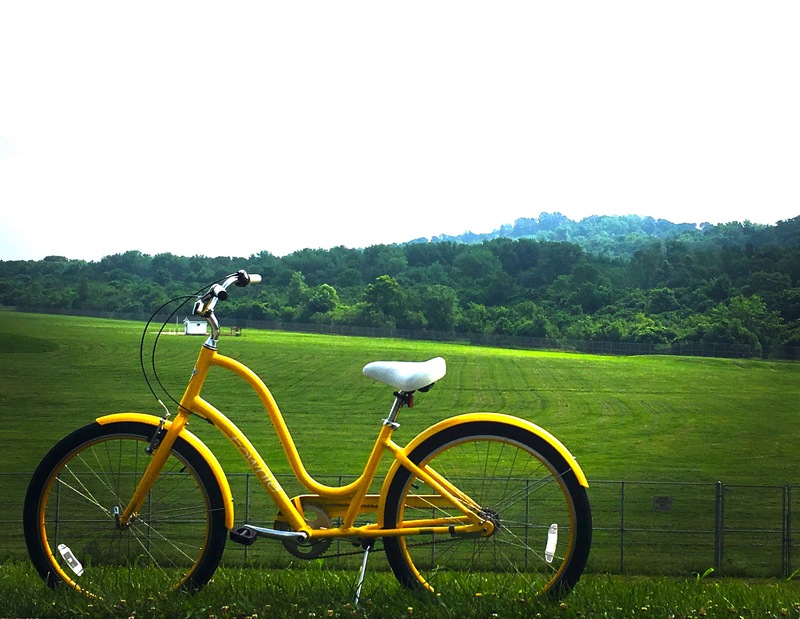 That’s my sunshine, three-speed, yellow cruiser! And I love her! When I felt comfortable enough, I moved to Otto Armleder Park because it’s basically flat and it’s pretty. Guess what I learned?! Bike riding is in fact fun. It is truly an exercise that never feels like punishment. After Otto Armleder, I eagerly approached the Little Miami Scenic Trail out of Newtown. And it was beautiful. My new form of exercise was a doorway to parts of the city I had not seen before. There are so many places to ride in and around Cincinnati and Northern Kentucky. Places like Smale Riverfront Park (my favorite park) and Lunken Airport. 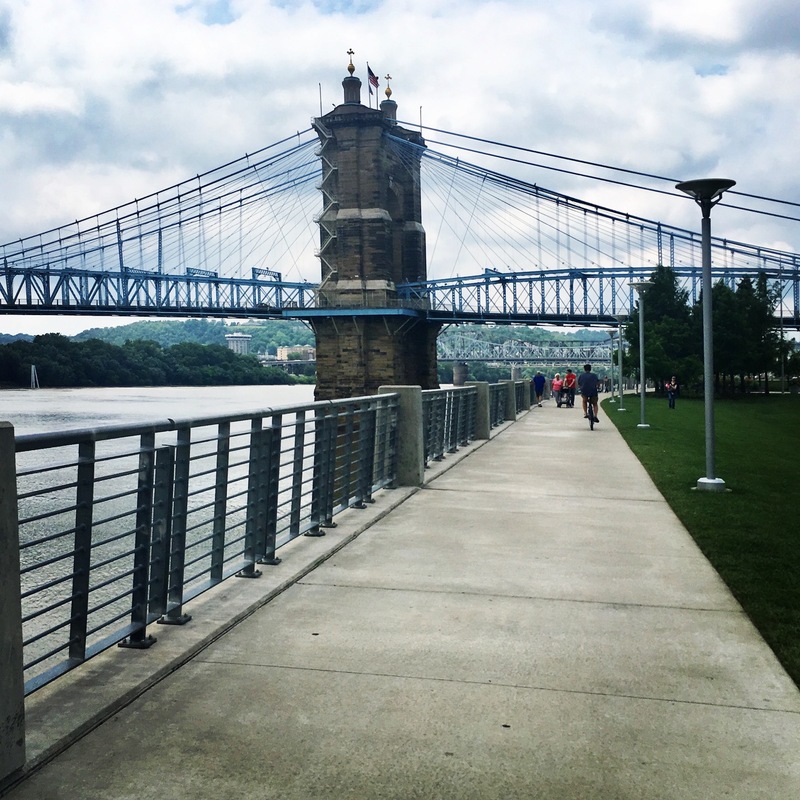 At Smale you can pause at the swings and enjoy the river view or stop and play a giant game of chess. 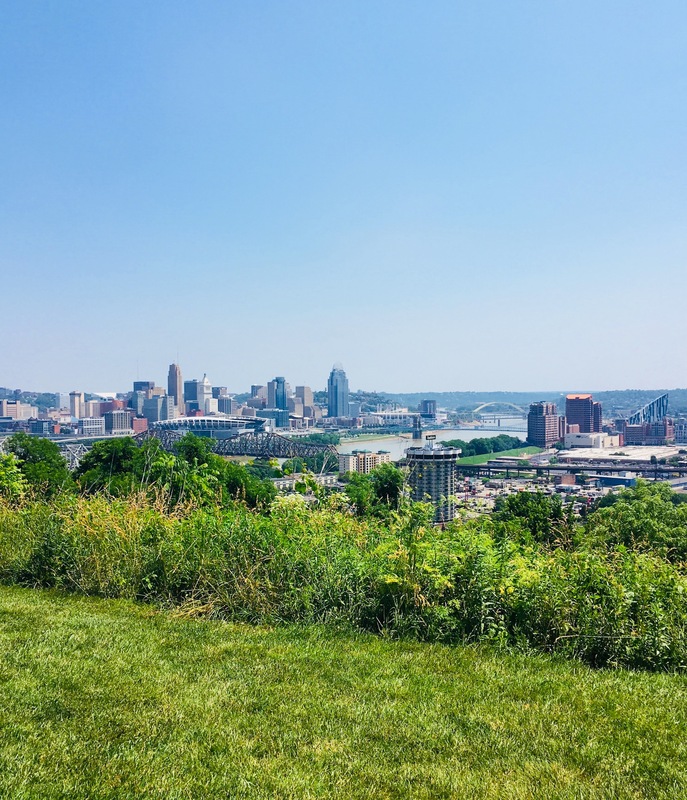 At Lunken you can grab your breath on a bench watching planes fly overhead. If you’ve never been to Devou Park, the view is breathtaking and there are several riding trails available. 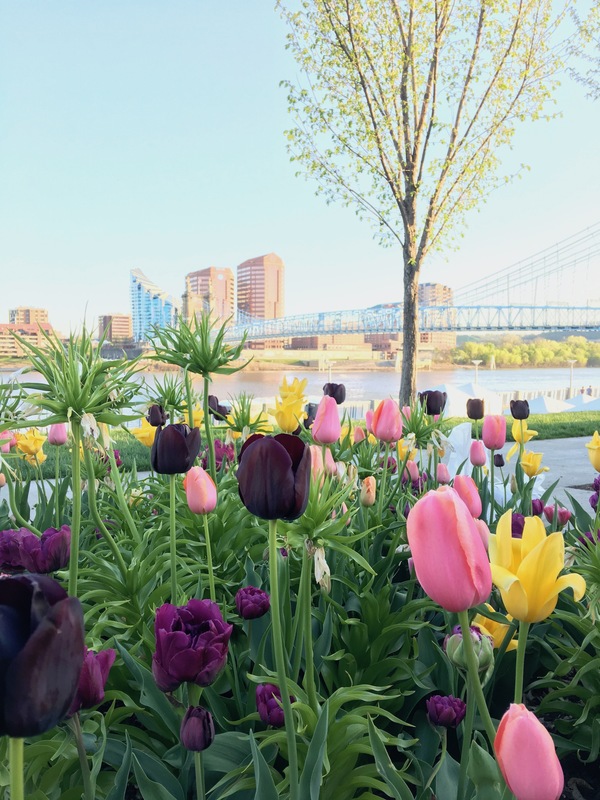 Breaking to stop and smell the flowers at Smale. Taking a break to watch the planes at Lunken. Summer view from the top of Devou Park. And, oh, the Loveland Bike Trail! Oh, my stars! It’s miles and miles and miles and miles and miles of trails that stretch across the city and beyond. There are locations everywhere! I often begin in Newtown because that’s the closest location to my house. Now that I’m starting to build some endurance, I love riding from Milford and Loveland as well. These trails are beautiful. 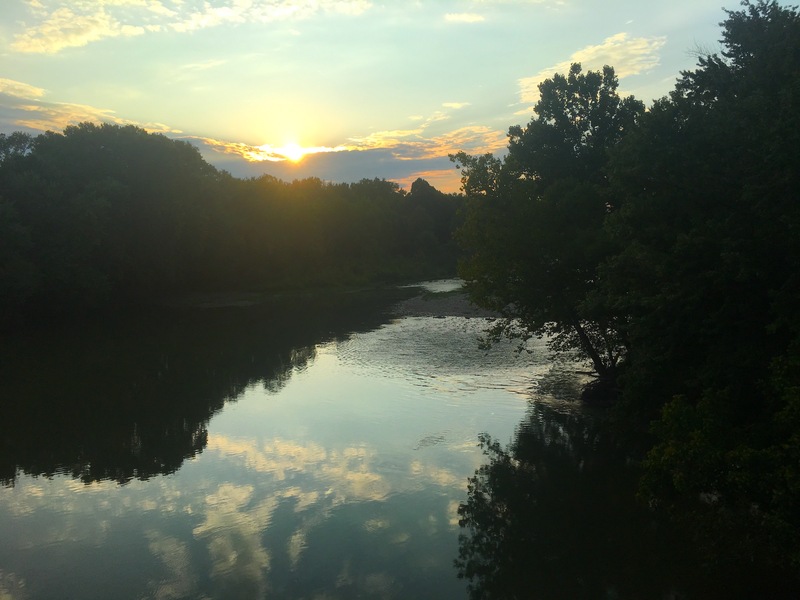 Each location is covered by trees, many run along the Little Miami, and some slide by quiet neighborhoods or bustling restaurants. And, if you need a break, there are often benches and picnic tables situated along the way. I’ve said it before- I love this city of Cincinnati. Bicycling has just added to that love. It’s allowed me to see sites I didn’t see before. The view from the trail at Newtown. 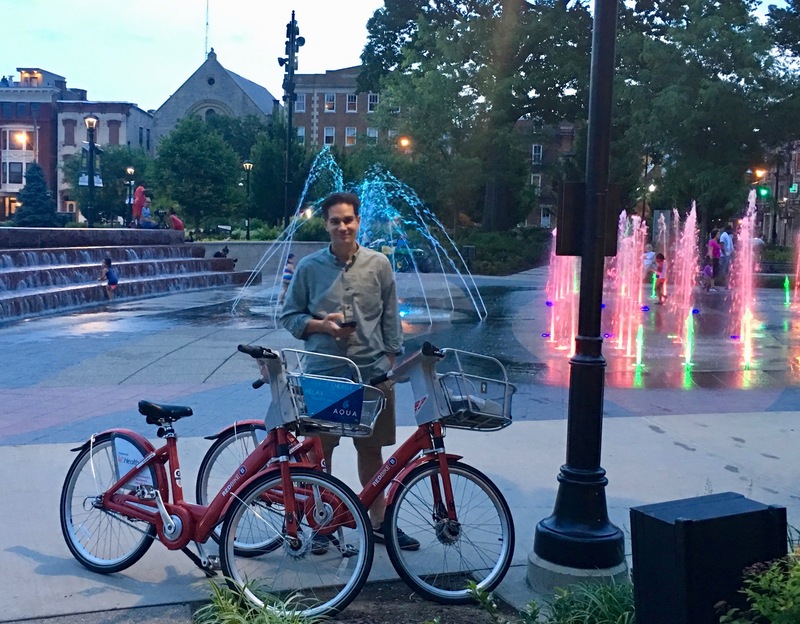 One night, while strolling Washington Park on a date night, we decided, on a whim, to rent Red Bikes. We rode through the fountains, around the park, and through OTR. If you’ve ever been tempted, the Red Bikes are easy to ride. You can grab them in one location and return them to another. Renting Red Bikes at Washington park. My husband rides with me. My friends ride with me. It’s community. It’s detaching from the hustle and bustle. It’s adventure. It’s being a kid again. If you ever want to go for a ride, I’m your girl. Seriously, the more the merrier. I might not be a long distance rider (yet), but even as I’m sweating and pushing, I love each of those miles. I love the sunshine. I love the cool air. I love the freedom. I love being outside. I love quieting my mind. Want to know more about cruising the city on two wheels? Check out Red Bikes here. Don’t have a bike to explore the bike trail? Rent one! Want to find out about all the cool trails in your area, get the All Trails App. Biking truly is for everyone. I encourage you to get out and ride the local trails, even if you are new to biking! I’d also love to hear about your favorite places to go bike riding. GO THERE (Biking around the city)! 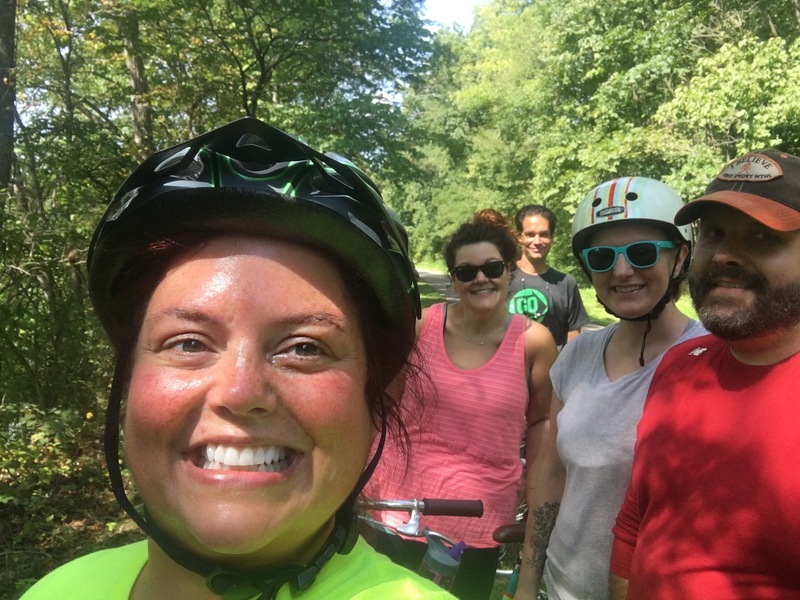 TRY THAT (Riding the Loveland Bike Trail; Riding with friends)! Love this. You go Girl.